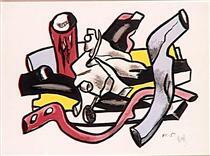 Regarded as the forerunner of the up and coming Pop Art style, Fernand Leger was a French painter, sculptor and filmmaker, working in his own form of cubism, modified into a figurative style. 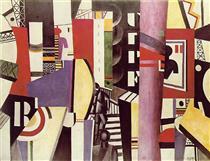 He originally trained as an architect, and worked as an architectural draftsman in Paris in 1900. 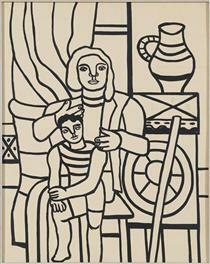 By 1903, after a brief stint in the Versailles military service, Leger enrolled at the School of Decorative Arts in Paris, and later applied to the School of Fine Arts, where he was rejected. Nevertheless, he attended art classes as an unenrolled student, and began working seriously as an artist at the age of 25. In 1909, he moved to Montparnasse, France, and met such leaders of the avant-garde movement as Lipchitz and Chagall, and later formed the Section D’Or, a group of avant-garde artists, who eventually produced the Salon des Independants. At the onset of World War I, Leger became mobilized as a unit in the French army, traveling to Argonne, and suffering a mustard gas attack on the front lines, which almost killed him. During his stay in the army, he created many sketches of artillery, fellow soldiers, and airplanes, which led to his later “mechanical period,” in which he painted tubular and machine-like forms. 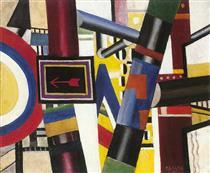 As a lover of the cinema, Leger contemplated leaving painting in order to pursue filmmaking. Along with various movie set deigns, he directed and produced an independent film, “Ballet Mecanique,” in 1924. 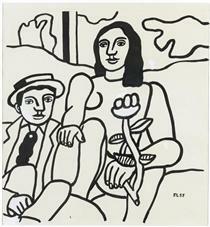 In that same year, he established a free art school, where he taught many renowned artists. Not just a painter, his prolific works include set designs, book illustrations, murals, stained glass windows, mosaics, and ceramic sculptures. 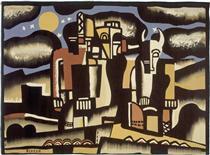 In 1931, he was invited to the United States to decorate the apartment of Nelson Rockefeller in New York City, where he fell in love with the harsh city landscape. 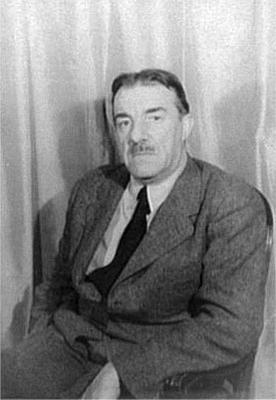 He lived in the United States during World War II, returning to France after the war in 1945, and joining the communist party. He died ten years later. The first painter to make the products of the consumer age a formative influence on his paintings, he is considered the father of modern Pop Art, and his paintings have sold for as much as $22 million. 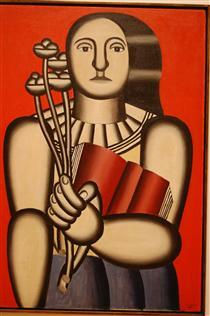 Léger was born in Argentan, Orne, Lower Normandy, where his father raised cattle. 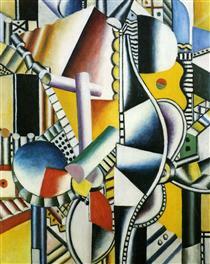 Fernand Léger initially trained as an architect from 1897 to 1899, before moving in 1900 to Paris, where he supported himself as an architectural draftsman. After military service in Versailles, Yvelines, in 1902–1903, he enrolled at the School of Decorative Arts after his application to the École des Beaux-Arts was rejected. He nevertheless attended the Beaux-Arts as a non-enrolled student, spending what he described as "three empty and useless years" studying with Gérôme and others, while also studying at the Académie Julian. 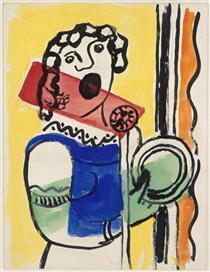 He began to work seriously as a painter only at the age of 25. At this point his work showed the influence of impressionism, as seen in Le Jardin de ma mère (My Mother's Garden) of 1905, one of the few paintings from this period that he did not later destroy. 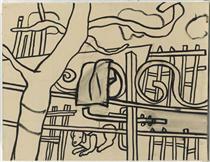 A new emphasis on drawing and geometry appeared in Léger's work after he saw the Cézanne retrospective at the Salon d'Automne in 1907. In 1909 he moved to Montparnasse and met Alexander Archipenko, Jacques Lipchitz, Marc Chagall, Joseph Csaky and Robert Delaunay. 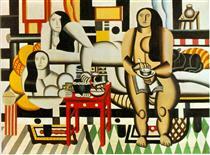 In 1910 he exhibited at the Salon d'Automne in the same room (salle VIII) as Jean Metzinger and Henri Le Fauconnier. 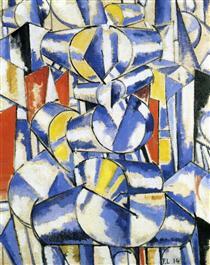 In his major painting of this period, Nudes in the Forest, Léger displays a personal form of Cubism that his critics termed "Tubism" for its emphasis on cylindrical forms. 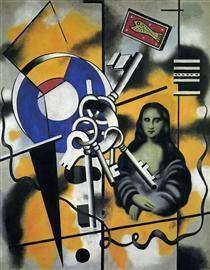 In 1911 the hanging committee of the Salon des Indépendants placed together the painters identified as 'Cubists'. 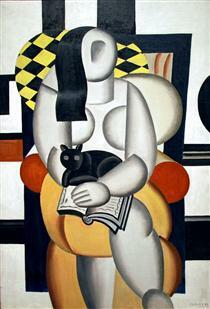 Metzinger, Albert Gleizes, Le Fauconnier, Delaunay and Léger were responsible for revealing Cubism to the general public for the first time as an organized group. 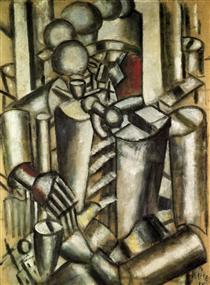 The following year he again exhibited at the Salon d'Automne and Indépendants with the Cubists, and joined with several artists, including Le Fauconnier, Metzinger, Gleizes, Francis Picabia and the Duchamp brothers, Jacques Villon, Raymond Duchamp-Villon and Marcel Duchamp to form the Puteaux Group—also called the Section d'Or (The Golden Section). 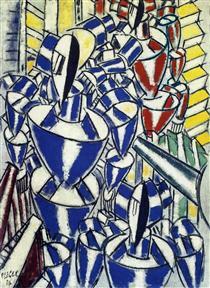 Léger's paintings, from then until 1914, became increasingly abstract. 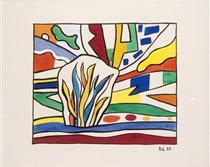 Their tubular, conical, and cubed forms are laconically rendered in rough patches of primary colors plus green, black and white, as seen in the series of paintings with the title Contrasting Forms. 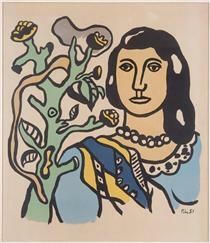 Léger made no use of the collage technique pioneered by Braque and Picasso. 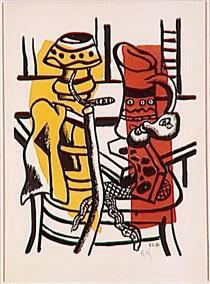 The Creation of the World Fernand Leger ? 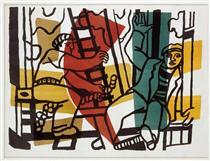 The railway crossing Fernand Leger ?